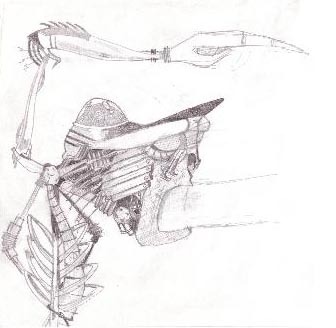 This second picture shows my growing interest for the biomechanical style mentioned earlier. I guess this one and the previous piccy were done around 1997. No real vision behind this painting, I guess I started doodling one component, then made it an arm, added some more, a screw here, a metal spine there and there you go. I don't think I mentioned it before, but I often start drawing without having any idea in mind, just feeling that my fingers are shaking with "creativity" :) some of these tries ended with quite nice pictures but you can be sure I have tons of sheets filled with unfinished stuff !